Have been playing with the Custom Category and I really like it. One issue I foresee is the difficulty in updating all packages when there is a change of the Custom Category. This file could be as simple as a 32x32.png file or maybe there could be an a GUI option that allows a new VIPM file type to be created. I am just trying to think of the best of both worlds where your Top Level mnu package is not an external dependency and its really easy to update wrt changes. Another idea is that it could be a separate package that is included as a sub-package (ties into Expose Sub Package idea. 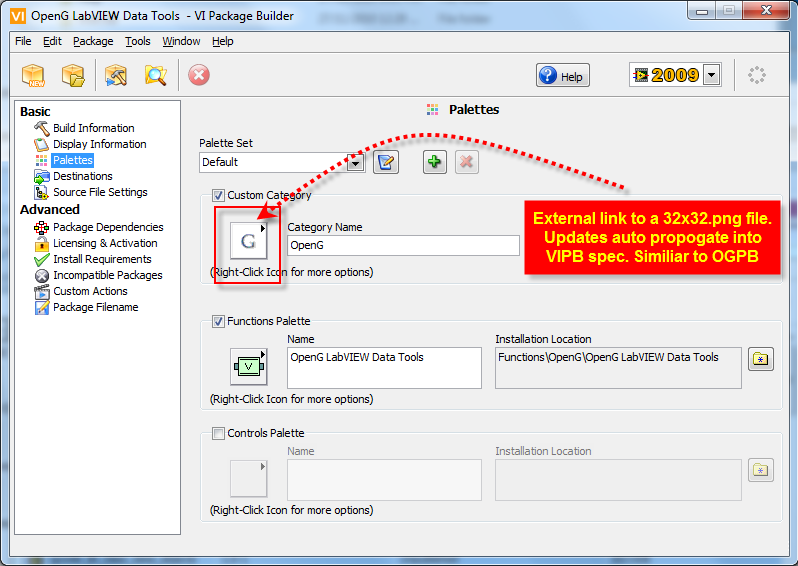 VIPM can upgrade to the latest if not already installed, but the user is only ever distributing/installing one package. We introduced the Custom Category idea in VIPM 2010 because many users were asking for the ability to have corporate palette categories with company logos mainly. We also wanted to make it as easy and intuitive as possible. Your suggestions are great. I like the idea of linking to an external png file for the category icon. This could follow the same behavior seen when selecting an external license agreement file. It would make things much easier for companies building multiple packages under one category.